Congratulations! You've decided to purchase a Lake Havasu home. Instead of paying someone else's mortgage (aka, renting), you choose to invest that money into your own piece of the American dream. As a first-time homeowner, you don't know what to expect. 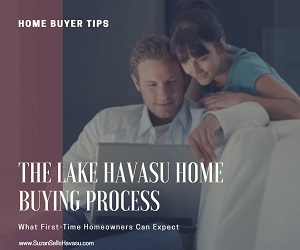 The Lake Havasu home buying process can be summed up in five steps: financing, finding a home, making an offer, getting a home inspection and closing the deal. First things first. Secure your financing right away. Even before you start looking at Lake Havasu homes, talk to your bank. Most Sellers won't even entertain an offer without proof of financing to back it up. Also, this helps you narrow your focus of properties to consider. Avoid falling in love with that $450,000 home when you're only approved for $300,000. The next part of the Lake Havasu home buying process is the home search itself. Start searching for Lake Havasu homes for sale online. Next, tell your Havasu real estate agent what you want in a home (size, bedrooms, amenities, etc.). They maneuver through the market every day. If they can't find what you're looking for, it's probably not out there. Finally, drive around. Focus on the neighborhoods you would like to live in. Be on the lookout for "for sale" signs. Let your agent know when you come across something you're interested in. They'll be able to get you inside for a closer inspection. After you've found that perfect Lake Havasu home, talk to your agent about putting in an offer. Discuss what would be a fair amount. Is the listing price higher than it should be? Could you be facing a multiple offer situation due to its desirability? How long has it been on the market? Utilize your agent's knowledge of the local market to make an attractive offer that the Seller will be most likely to consider. After the Seller accepts your offer, the next step in the Lake Havasu home buying process involves the home inspection. Even if you're buying a newly constructed home, hire a home inspector to take a look. Their trained eye can spot potential problems that may not have been disclosed before you entered escrow. If these are costly, you may be able to re-negotiate the price, ask for the Seller to repair the issues or rescind your offer and walk away. It's well worth the couple hundred dollars for the information a professional can provide. You found your perfect Lake Havasu home. The Seller accepted your offer. Your inspector found nothing significant to report. Now, it's time to close the deal. Your bank requires a home appraisal before final approval can be made. If the house doesn't appraise for at least what you're borrowing, they won't approve the loan. When that happens, your options include coming up with more money to cover the difference, trying to negotiate down the price with the Seller or walking away from the transaction altogether. Other paperwork involves a title search, obtaining private mortgage insurance (if putting less than 20% down) and various legalities for transfer of ownership. Don't fret the Lake Havasu home buying process. Many first-time homeowners feel overwhelmed. But that's why you hired me. Rest assured that I'll handle anything thrown your way throughout this process. Happy homeowners are my life's blood. I look forward to working with yo.